I am not sure if every challenge I face artistically always leads to something amazing, but I do appreciate those challenges as an influence leading me to the next step. 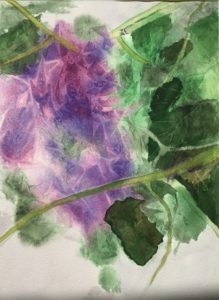 When I retired from teaching I made a decision to spend more time working with watercolor. I had “dabbled” in watercolor on and off for many years. Working full time, having responsibilities for family and then finding time for painting was truly a challenge. Once retired, I went back to art classes for growth. The challenge for growing and expanding practice became a creative influence as it lead me to a number of opportunities for learning. Skills were rusty, transitioning to actually having time to paint raised challenges to when, how, what to focus my attention. Not only did I work and practice to alleviate some of those rusty skills but the people who were in those classes and workshops spurred me on and provided community. When I faced the challenge that my home not being conducive as a studio, the challenge led me to finding a reasonably rentable space. That studio is today my “home away home.” It felt indulgent to rent space but I came to realize if I wanted to be serious about painting I needed to solve that challenge. This later led to a studio name, website, and a Facebook page for Artscape Studio. Having a studio brought many creative influences with other artists who occupied other studios. My studio provided a space to quietly and in solitude consider what was influencing me in a painting. A challenge I currently face is selling work balanced with creating work. My artist community has expanded and three artists in the community and I are collaborating in having an art event/sale next weekend. We call ourselves “The Four Artistas.” I am looking forward to the experience of selling art at this event with three other artists. If all goes well we will do this collaborative sale again. 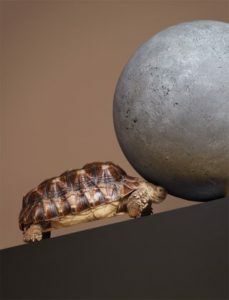 Do you see struggle as the road to opportunity? Do you learn from your failures? Do you seek to get up to bat as often as possible? 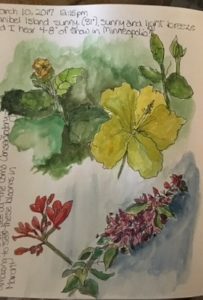 I envy my artist friends who go on vacation and spend a great deal of time drawing in sketchbooks, painting, and working with mixed media while away from home. How do they do that? 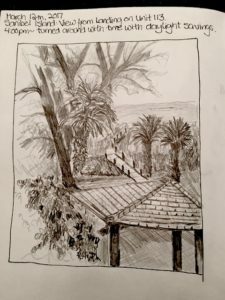 Since I was being flummoxed by combining vacation and work I went on-line to read what other artists think about vacationing and keeping up with their own art practices. be okay that drawings will be a combination of quick on the spot sketching, with less detail and not finished. leave the first page or two of each day blank-at the end of the day use the pages for maps and streets walked that day or traveled by other means. draw the view from the room, if it is a good view. be okay leaving lots of white space on the page-it can be filled in later if it looks too sparse. write commentary about personal feelings, thinking, reactions to things, smells, places. when sketching buildings and vistas: just draw a section, leave the top, bottom or sides unfinished. Let lines drift off, only add color for some parts. In this fast paced world, we need to slow down, see and record what is happening around us. Somewhere in all of this thinking about vacation is an answer for how much time I should spend for art practice and how much time for vacation. I just need to keep trying out different scenarios for maintaining balance! I have seemingly little “down time” to think about my own artistic process. This month we are living in Florida and away from the distractions of work, family, and responsibilities of keeping a home. The hiatus has provided me time to consider this question. A succession of states, steps, stages, through which the human evolves together with artistic phenomenon, characterized in two ways: as an external action, through the sequence of steps of artistic activity (creation, reception, interpretation, listening, etc. ); and as the inner action in the succession of states and inner experiences of artistic activity. My process began as a curiosity about using a technique that I had not considered using in a very long time. My curiosity was sparked by a painting posted on-line that a friend had created. Karen had started the painting used plastic wrap over wet watercolor. I remembered that this technique was engaging and usually provided unintended textures and shapes that were fun and challenging to work with. So I began to play. 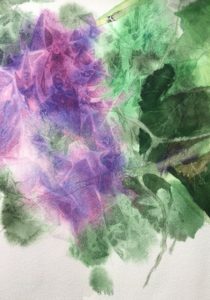 I laid down juicy wet colors, covered my paper with scrunched plastic wrap, put the paper with plastic wrap under some weight and let it dry overnight. Not peeking was hard! My curiosity led to the engagement of my imagination. What did I see on this paper? What could I create? Interpret? I began to see leaves and vines which started me on the path to moving towards a grape vine? A vine of morning glories? I listened to myself posing the questions about the possibilities. 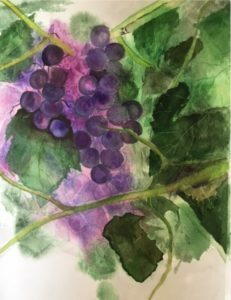 Engaging external action, I began to develop leaf shapes based on images of grape vines I had photographed many summers ago. Deciding what would be in front, behind became a time spent with problem solving and creative thinking. I went with my intuition and conjured up my past experiences of drawing vines and foliage. I referenced my photographs. Getting stuck on the leaf shapes I moved into adding some clumps of grapes. 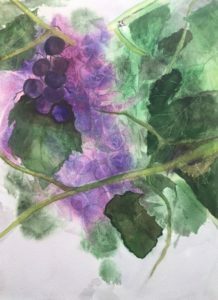 Moving from grape shapes to leaf shapes bounced me around the painting. Revision, problem solving, critical thinking was all part of the morning of painting. I went back to external action, lifting color, glazing, deepening values, adding texture with my brush. 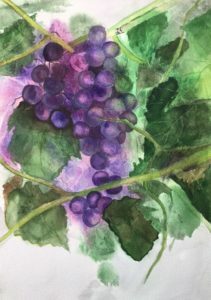 More grapes, more values, more leaves as I continued to paint. Stopping to critique what I was doing. Keeping my inner critic at bay so I could just “go for it.” I found myself going between external and internal actions. Back and forth, push and pull. This is where I have stopped. Maybe I am done, but maybe not. Before I add my signature to the painting it sits on the drawing board and I revisit with my editing eye and with a comparison of the work to my intent. And the process will begin again with that one wonderful word….Curiosity!